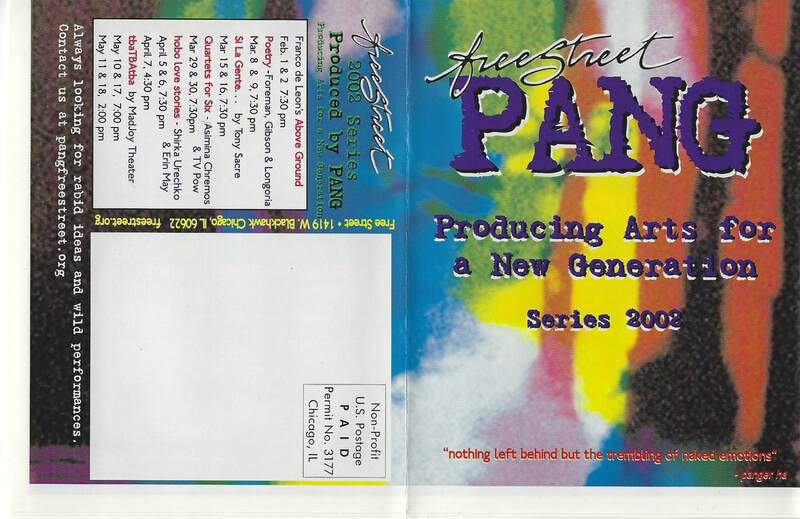 In 2000 Free Street began a program mentoring teens in the production of a theater season facilitated by Bryn Magnus. The teens named it PANG, an acronym for Producing Arts for a New Generation. Teens curated the season, booked the artists, designed the publicity materials, wrote press releases and contact the press, set up the technical aspects for the theater, and ran the box office. PANG produced four seasons of work from 2000-2004. The shows are included in the Performance Archive. PANG is an ensemble of 8 teen produces craving wild art and new theatrical forms. We want to go beyond mas media fodder and present work that is unique, challenging and risky. 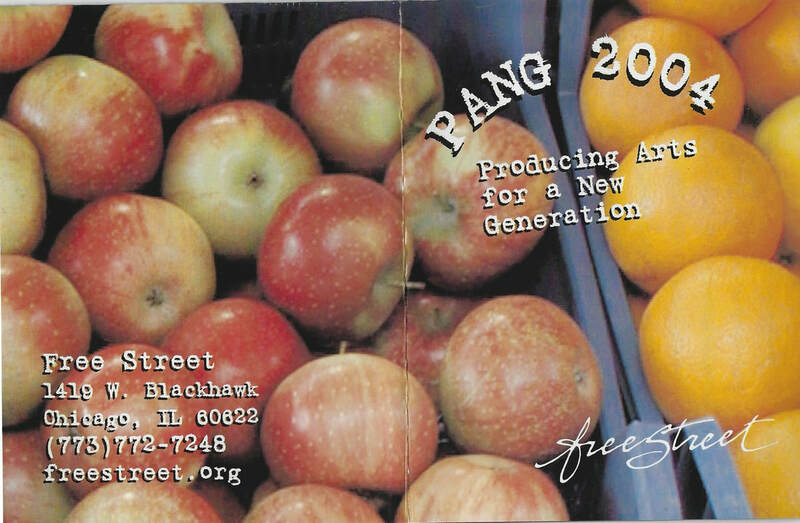 PANG is a TeenStreet jobs initiative and one of Free Street's body of creative programs. Free Street opens the potential of youth through inspired arts education. With Producing Arts for a New Generation, Free Street is expanding to include innovative training in the business of art. Free Street's philosophy directly relates creative development to quality of life, passion, curiosity, and motivation. PANG's hope is that the artists we host will expand our aesthetic knowledge, and create a new audience for interesting performance work. the business of show business. Street can determine, it's the only program of its kind in the U.S.
needs to take a stack and hand them out around school." this year's series. But that doesn't mean the work will stop soon. to her, PANG isn't supposed to be in the space until after six. with performances on Friday and Saturday nights. I don’t remember exactly when in 2000 or 2001 that I was speaking with David Schein at Lunar Cabaret. He was asking me about Beau O’Reilly because Free Street had just been awarded a three year audience development grant from Theater Communications Group. David thought Beau might be a great fit to run that program at Free Street. At some point in the conversation I may have said, ‘What about me?” Or it’s possible that David asked outright if I would be interested. And I was and so I assumed the role of program director of what would become PANG—Producing Arts for a New Generation. The idea was to form an ensemble of youth artists who were also interested in learning how to produce a season of performances. In parallel with the general Free Street call for teen participants, we put out a call for teens interested in producing. The first PANG ensemble was Leo Asuncion, Mariana Barajas, Denise Hernandez, LaMya Holley, Dinorah Jimenez, Jojo Klonsky, Kelley Minneci, and Terri Montes. One of our first tasks was to name the ensemble. We brainstormed and did writing exercises to try and describe the idea behind the ensemble—to create new audiences for interesting and relevant performance work. My memory, which could be totally wrong, is that Leo came up with PANG—producing arts for a new generation. Everyone loved it and that is what we became. We developed a framework for what we were looking for when looking for ‘interesting and relevant’ work. Then we searched for artists through word of mouth and online. And as we found artists we reached out to them with invitations to be part of our season. When artists agreed, we created contracts and got them signed. Once we had the commitments in place we worked with Anita to design a brochure and press releases. All decisions were made collaboratively by the ensemble. And on performance nights, we worked together on load in, set up, lights and sound. The whole stage management package. The TCG award was for three years 2001, 2002, 2003, and PANG’s final season 2004 was supported by other funders. With each season, and each new ensemble, we learned more and got better at producing. We partnered with the Chicago Department of Cultural Affairs and PAC/Edge Fest to give the ensemble a sense of where the skills they were learning might take them. Toward the end of the PANG program, the ensemble began to morph into creating original work. That’s how Angel in Moloch came about. Within the 2004 ensemble, we began discussions about spiritual exploration, states of ecstasy, and the dangers those things pose to young people in rough and tumble Chicago neighborhoods. We read Allen Ginsberg’s Howl and discussed drugs and those kinds of altered states. Playwright Idris Goodwin was a guest artist in that ensemble and the discussions became creative explorations of ideas around states of ecstasy and how to navigate spiritual growth in a highly material realm. PANG had been exposed to many different types of performance by that time and there was a keen interest in combining hiphop with butoh. On a language level as well as physically. We discussed how butoh was a creative child that grew out of the horror of Hiroshima and Nagasaki. And we thought hiphop was a creative child that grew out of the horror of urban decay in the Bronx and elsewhere. There was a parallel there that the teens inherently grasped. The ensemble was also participating in the regular Saturday workshops so they had grounding in Ron’s release approach. One of my strongest memories of that show was Corey Keiloloe—his profound stillness upstage center. It was a powerful counterpoint to the choreography and dialog going on around him. I think he stood still and silent for as long as 40 minutes before moving downstage. Many people in the audience remarked on the power of that stillness. The final performance for PANG was a collaboration with Columbia College. Brian Shaw and I co-directed an ensemble of 10 Columbia College theater students and 10 Free Street teens. We worked over the summer of 2004 and to develop Recyclone. Brian Shaw had become very alarmed at the waste of bigger theater companies that threw away enormous amounts of wood and set materials after their shows closed. There was no recycling. So we reached out to the Goodman and Steppenwolf and Columbia College even to be alerted when they stuck their sets so we could gather the material. With the materials we gathered we created these great catapults and other contraptions that were very popular with the public park kids.